Karen and Doug had an intimate wedding for 25 guests at the Silver Coach Restaurant in Stevens Point, Wisconsin. 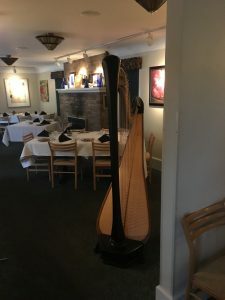 No matter what the size of your guest list, a harpist is the perfect touch for any wedding! Their ceremony took place in the back room of the restaurant, itself a converted railroad car. As the bridesmaid and bride came down the aisle, I played “Have I Told You Lately that I Love You.” When you have a small wedding party, it doesn’t take very long for them to get town the aisle! Having one piece for the entire processional makes the music sound less choppy and provides musical continuity at the beginning of the service. The recessional was the groom’s special request – “Stairway to Heaven.” He was a bit distracted at the end of the ceremony, and didn’t really hear it – so he requested a repeat during the reception! 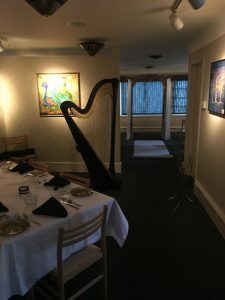 As guests arrived and as dinner was served, I played a variety of popular songs, including “Perfect” by Ed Sheeran, “Come Sail Away” by Styx, and “Bless the Broken Road” by Rascal Flatts. For weddings large and small, I enjoy working with couples to create a memorable and meaningful playlist for their ceremonies. 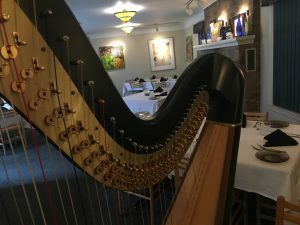 Contact me via my website ~ Stevens Point Wedding Harpist ~ to start planning your wedding music! 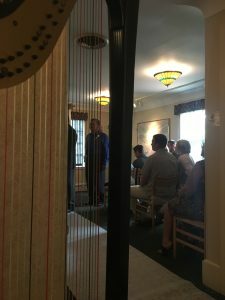 I play for weddings throughout Wisconsin and around the world. This entry was posted in Indoor Wedding Ceremonies, Wedding Receptions, Weddings and tagged ceremony, penti, reception, silver coach restaurant, stevens point, wedding, wisconsin. Bookmark the permalink.